Two years ago I didn’t know what a “deck” was, but fast forward to today and our team at ooomf has prepared multiple investor presentations, raising two rounds of investor funding. We just closed a $2 million dollar investment from a group of investors we couldn’t be more excited to be working with and I thought it might be helpful to share our process for how we created our investor presentation. 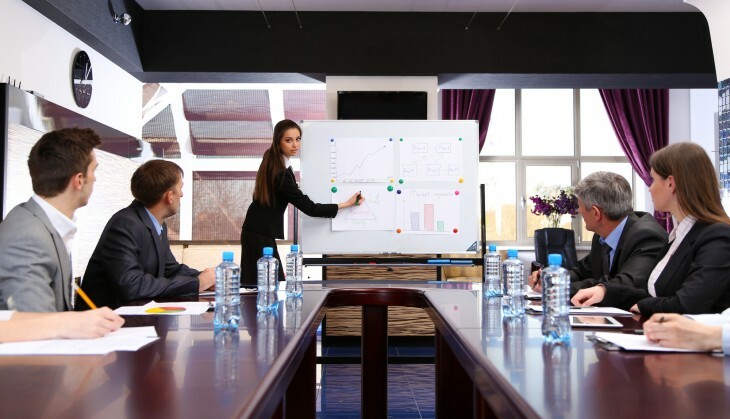 For investors that don’t know you yet, your presentation will likely be one of the first impressions they get of your company so it’s an important piece to do right. There are tons of articles, resources, and books about how you should model your investor presentation and you can drive yourself insane trying to follow each format exactly. Some investors say you should always put the Team slide first, while others say you should save it until the end. Some say you need to include a slide about the problem you’re solving, while others say there are no such things as problems, only opportunities. Before you fire up Keynote or Powerpoint to design any slides, it’s important to know the main elements you could include in your story but you ultimately need to craft the best story based on your company’s unique combination of team, traction, product, market, etc. There isn’t a one-size-fits-all template. Introduction — Who are you? What is your company name? Opportunity/Problem — What problem are you solving and/or what’s the opportunity you’re after? Solution — How are you solving the problem? Team — Who are the key members on your team? 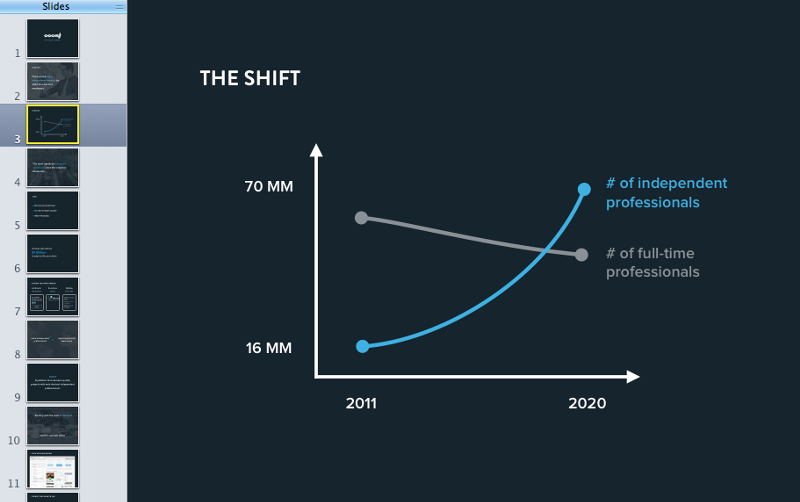 Traction — How fast are you growing over what period of time? Vision — Where are you going to be five years from now? 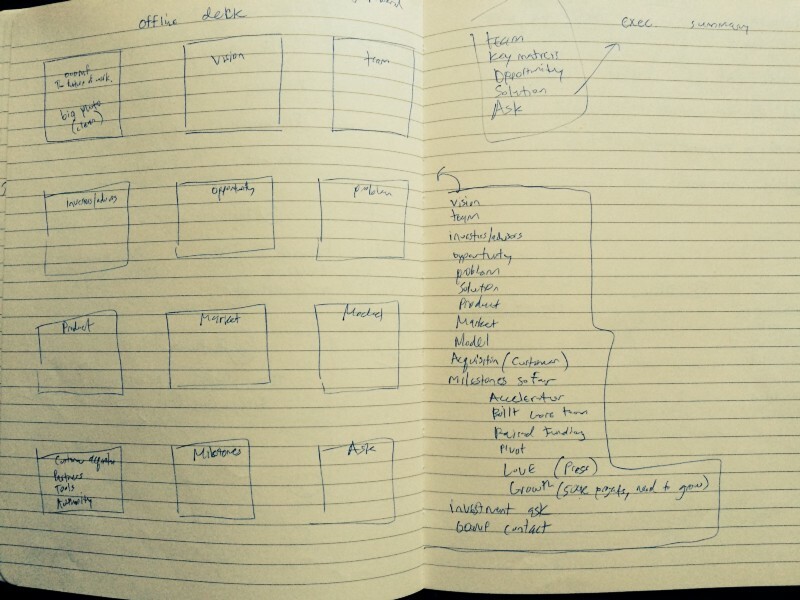 Product — How does your product work? Market — What does this market look like? Is it growing? Business Model — How do you make money? 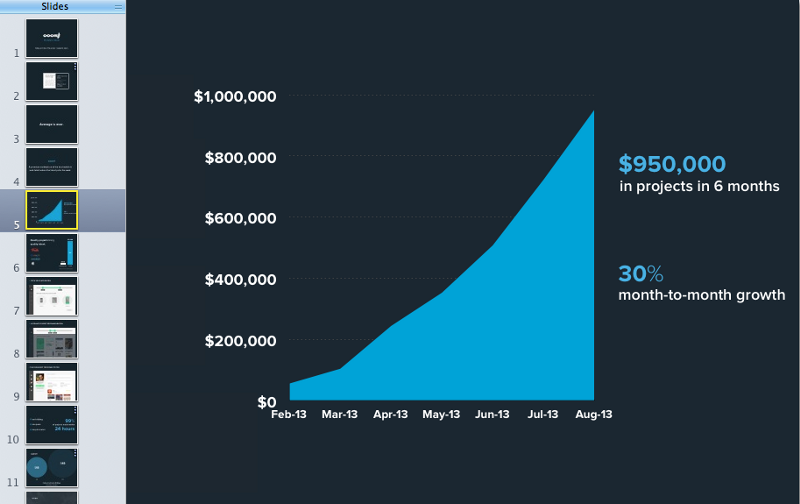 Customer Acquisition — How do you plan to grow? Because ooomf is a vetted network of mobile and Web independent professionals where the professionals pick their work, we thought one of the strongest parts of our presentation was the opportunity in our market. 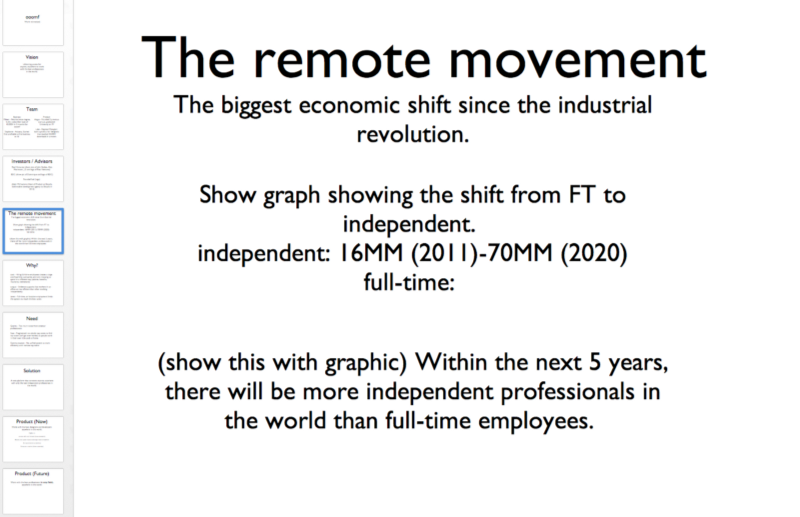 The economic shift toward independent, remote work is happening now and is expected to only accelerate over the coming years. We knew this structure would evolve, but we wanted to lay down a high- level view of our presentation to make it easier to understand the pieces we had to play with before getting into the details of each slide. Once we thought we nailed the general structure for our story, we moved the content into Keynote but still kept the presentation to just text on slides — no images or pretty typefaces yet. I held on to the presentation for a week, reviewing the slides a few times each day to get a different perspective on how the story could flow. There’s many different paths your story can go and giving yourself time to reflect on it will help you consider different alternatives that could make your story better. We believed the story was now at a point where it would be ready to share with potential investors so we polished the slides for presentation. Note that we moved the point about our opportunity from the fifth to the third slide in our presentation. Our intent was to hopefully draw the attention of potential investors to this trend in the economy early on in our presentation. At this point, we had yet to show our investor deck to any investors so we didn’t know how it would be received. Before talking to new investors, we wrote to some of our current investors letting them know we were going to be sharing our story and would love for them to hear it first. Just like testing a product, we wanted to test our presentation by getting feedback from our target audience. We went into these initial meetings thinking we had all the elements we were expected to have in a strong investor presentation, but when we finished sharing our story, there seemed to be a lack of enthusiasm. I could feel there was no emotion in the room and our presentation felt flat. We reflected over the next few days, feeling deflated and wondering what went wrong. I was lucky to grab coffee with my friend Julien Smith (who just raised an investment from notable investors including Gary Vaynerchuk). During our conversation, we ended up talking about how our team was working on our investor presentation. I spoke about the opportunity in our market and how we were going about solving the problem. I started to sense the same emotional disconnect in this conversation with Julien that we experienced sharing our investor deck with our current investors. This sparked a thought that perhaps the focal point of our story should not be on the opportunity in our market, but rather our rate of growth was more of a sign that we were onto something. Julien shared some thoughts about how we could structure our presentation to get to the traction elements of our story much sooner. Moving our traction slide from the middle of our presentation to the beginning, made a huge impact for our story. We started speaking with new investors and it proved to be something that stood out. The first few times we presented this story, we received multiple invitations for follow up meetings. We could feel the emotional difference in this version of our presentation compared to the first version. We shared our story with fifty investors over the next three months, closing a $2 million investment round from 11 investors. In hindsight, we realized that perhaps having “all the elements we were were expected to have” could have actually been the problem with the first version of our presentation. Our story was too predictable. And because everything in our presentation was expected, it was like hearing a song get overplayed on the radio. No matter how good that song might be, you eventually become numb to it. You may even start to dislike it. Investors see hundreds of pitches a year and can almost predict what’s coming next if the structure of your story seems to fit with something they’ve seen or heard before. Granted it’s hard to control all variables when trying to gauge how investors will feel about your pitch. Like most people, investor opinions are influenced by many factors outside of your control but getting early versions of your presentation in front of at least a few investors can help sniff out a story that might lack impact. This “something that stands out” doesn’t necessarily have to be a novel idea, it could also mean a high rate of growth or a unique way of getting customers. Investors are trying to find the exceptional outcomes, so they are looking for something exceptional about the company. Instead of trying to do everything well (traction, team, product, social proof, pitch, etc. ), do one thing exceptional. As a startup you have to be exceptional in at least one regard. We saw the importance of getting our investor deck out early to get “real world” input. If we hadn’t shown our first presentation to anyone, we may have shared a weaker story with potential investors and conversations could have stalled. There’s a lot that you could think of including in your investor presentation, but every company is unique so it’s up to you to determine how to tell your story the right way. The main goal of your presentation is to get investors to understand that you could be onto something with your business. Focus on highlighting the sign(s) that point to this. In our case it was our traction but for your company, this sign could be an exceptional team, technology, or set of partnerships you have lined up. Keep in mind that a strong investor presentation alone likely won’t raise you money, but it can only help your cause if you do it right.